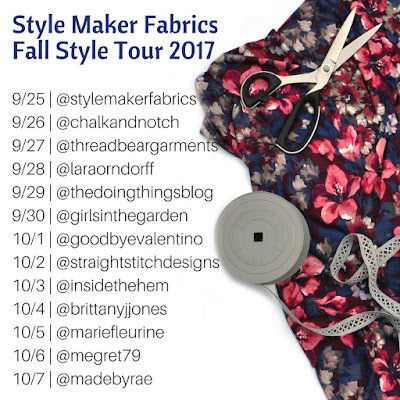 I'm pretty jazzed to be back for another Style Maker Fabrics blog tour! I really love how Michelle organizes her seasonal fabric selections by color, textures and themes. It's evident that a lot of work and thought goes into her curated collections! She ends up with so many unique, but coordinated fabrics, making it easy to put together an outfit. If you were doing a capsule wardrobe, this would be the place to start. You can read more about the Style Maker Fabrics seasonal collection process here. For my first fabric, I chose this ponte knit solid in wine (check out Lindsey's colorblocked dress for another take on this fabric!). This is a really high quality rayon/nylon/lycra ponte. Between the excellent quality and the matte deep red color, this is a really rich looking fabric. As they say on Project Runway, "It looks expensive." It's weighty, a bit stretchy, and silky feeling. I think it's pretty perfect for autumn and winter dresses because it won't get bunched up on your tights; it will slide right over with no need for a slip. 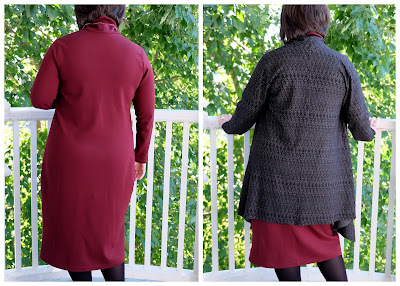 I paired the ponte with the Seamwork Neenah turtleneck dress pattern. I've had this pattern in my stash for a while now, but obviously no need to sew a turtleneck until my recent move. It's gotten good reviews around the interwebs (see Mary Alice, Dani, Beth, Christine, etc. ), so I thought I'd give it a go. I love a turtleneck when it's cold out. I cannot tolerate cold air going down the back of my neck! Looking at the size chart (which put me in a high L bust and low XL hip) and finished measurements (which indicate a significant amount negative ease at the bust), I decided to cut a straight size XL. I am not a huge fan of negative ease. I wanted a body skimming, not clingy dress. The only flat pattern adjustment I made was 3/4" full bicep adjustment. After trying on the dress, I made a few more tweaks: I skipped the cuffs, as I found the sleeves to be a good length without. Instead I did a 3/4" hem with my twin needle. I also decided that I wanted a slightly more pegged skirt, so I took in the sides, going from nothing at the hip to 1.5" at the hem. My fitting showed that I had some extra fabric under the armpit. Perhaps my bicep adjustment was too much? There was also extra fabric in the bodice, too, though, so I don't think it was only my adjustment causing the problem. I tried the dress on inside out and pinned out a bit of the extra fabric around that area, taking out a little fish eye shape. For my second piece, I chose this gorgeous herringbone wool blend double knit. It's a medium-weight wool blend with a small, irregular herringbone pattern in a greyish tan color on a black background. The pattern has a subtle striped effect that is really nice, and I like how it's a neutral, but it's far from boring. It also has a nice wrong side, which is important for my pattern choice. It seems to be impervious to wrinkles, which I love because I hate ironing (love pressing, hate ironing... anyone else?)! Pattern-wise, I went with the Style Arc Estelle jacket, a knee-length, waterfall-style cardigan/jacket thing. This pattern is perfect for ponte and double knits. I've had in my stash for a while now, but didn't really need a piece like this until recently! The hem, sleeves and front edges are all left raw/unhemmed. I like the way it looks now, but I reserve the right to go back and hem later. I haven't figured out which way I would hem it on the front bodice because both sides show, as I said earlier. I like this pattern a lot! It's so simple (three pattern pieces, four if you count the pockets, which I didn't add) and comes together really quickly. It has some nice details, like a center back seam with a bit of shaping to avoid swayback issues, and just enough drape at the front to look nice, but not be overwhelming. And I like the longer length, too. Good stuff, all around. I'll definitely make another! This outfit turned out just as I had hoped! Nothing fancy, but some stylish, versatile basics in high quality fabrics that will definitely see a lot of action in my wardrobe. I think think the Neenah and the Estelle look great together, but will also pair well with many of my other handmade items. That's it from me, but if you have time, do check out the other bloggers on the tour (links below). Rae, of Made by Rae fame, is anchoring this relay with her post tomorrow and I can't wait to see what she came up with. The bloggers earlier in the tour were pretty sensational, too, and provided me with a lot of inspiration! Did you see Gabriela's fabulous marbleized dress? Leslie's too-cool-for-school jacket? Michelle's athleisure loveliness? Thanks again for having me on the tour, Style Maker Fabrics!! You look incredible (and cozy!) in this combo! The Neenah looks fantastic on you and that fabric does, indeed, look "expensive." Love those flat finished seems on the cardy/jacket, as well. The whole thing looks straight from a fancy, overpriced boutique, lol! Seriously tho! Thanks, Inder! I am so happy with this outfit- it turned out even better than I hoped! I love this outfit! The dress is beautiful...the fabric and the fit. I also don't like a lot of negative ease and this fits you beautifully. I am a big fan of Style Arc patterns and have seen this pattern. The fabric choice is perfect and looks great with the dress. Well done! Thanks, Diane! They're both great patterns; highly recommend! 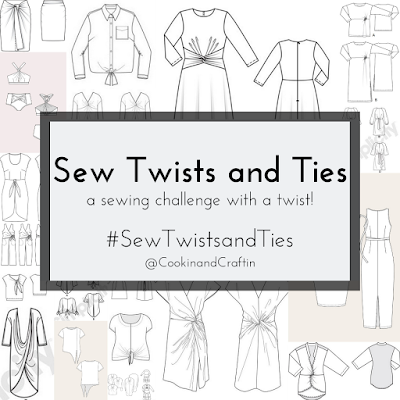 And the fabrics, too, are both winners. I feel like I will wear both of these often. That a really beautiful outfit combination on you Meg! You've tweaked it to fit you perfectly. I bet that you'll get lots of wear from it. Thanks, Lara! I think I will, too! Both seem like really useful pieces. Thanks, Barb! The fabric is really lovely and high quality. Brrr! I don't think it's been in the 30's yet here because we had a warm fall, but any day now it will get there! this color combination and outfit silhouette is VERY flattering on you! really terrific! Thanks so much! I love how it looks, but it's also incredibly comfy. Win-win! This is a beautiful combination on you, and your Neenah came out great! I love the insides of the cardigan. Thanks, Vanessa! The cardigan looks really professional, doesn't it? I hope the unfinished edges stay nice, too. I love both garments! The cardigan especially looks so soft and snuggly. Thanks! It's quite warm and lovely to wear! Looks so cosy - will definitely keep you warm now you are back in a temperate climate? Love these!! You look amazing and so profess!! Thanks, Rae! I love them, too. Thanks! It does feel nice not to be sweaty all the time. I am worried about the cold winter, though- I have gotten soft! Great pattern combination. Love the turtle neck with the Estelle jacket. Thanks, Jean! I was inspired by your many Estelles- such a versatile pattern!